Boxes and similar containers protect merchandise in shipment, and tape of various sorts protects the containers. Tape and tape accessories should be an integral part of every shipping department. Tape dispensers and in particular tape guns are a huge help in sealing packages and securing their flaps so that they stay sealed until the customer wants them opened. Tape can do more than just keep boxes from opening or falling apart. Special tapes are designed to attach shipping labels to containers without obscuring the information on the label. Water activated tape provides not only structural support but also positive evidence of any tampering. Pouch tape can attach printed materials to the outside of a container, and electrical tape is of course an insulator. All these tapes have their uses in a mailroom, and the savvy operator will evaluate each for their applicability to a company's needs. Purchasing quality tape can be quite simple. Internet suppliers offer everything from single rolls to pallet-sized bulk quantities. 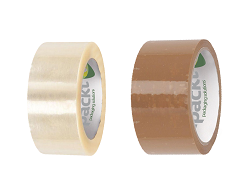 Order packing tape from eSupplyStore.com, by selecting from an incredible variety of products, moving them to our secure shopping cart, then entering shipping and payment data to complete the purchase.